Medical devices maker Taiwan Biophotonic (tBPC) has secured CE mark approval for its medical smart watch to monitor heart rate and blood oxygen. 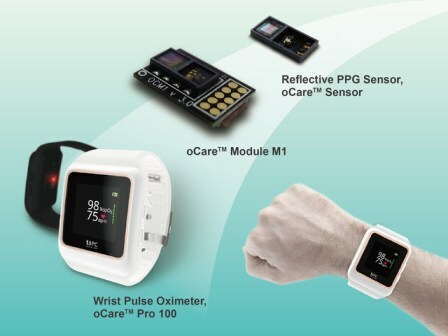 Claimed to be the world’s first medical smart watch, the finger-free wrist pulse oximeter, the oCare Pro 100, offers a non-invasive and simple method to measure and record heart rate and blood oxygen saturation on the wrist without clamping hindering wires and fingertip probe on the finger. The company designed new wrist pulse oximeter for adult users to check and record specific physiological parameters in various locations such as hospitals, hospital-type facilities and home environment. According to the company, the professional users can upload timely data measured during daily activities or sleeping for physical or clinical assessment. The new medical watch features DOE lens reflective PPG sensor (oCare sensor) , which includes two or more light emitting diodes (LEDs) and one or more photodiode light detectors (PDs) located side-by-side on a substrate. Light beams are reflected from LEDs through the skin to the arteriolar bed of the tissue. The arteriolar bed is said to absorb variable amounts of light during the pulsations. The PDs will measure changes in light absorption during the pulsing cycle from scattered light, which is reflected back from the pulsating arteriolar bed. The ratio of light absorbed is transformed into a measurement of heart rate and functional oxygen saturation. tBPC founder and president Dr JC Chen said: "Our oCare Sensor has high lighting efficiency and less power consumption than most common reflective PPG sensors, LED and photodiode components in the market. Image: The new medical smart watch is built with tBPC's patented DOE lens reflective PPG sensor. Photo: courtesy of PRNewsFoto / Taiwan Biophotonic Co.